Home The Weekly Armchair SANZAAR To Review The TMO!!! I very much doubt whether any of SANZAAR’s suits have read any of my frequent complaints about their officials and match officiating faux pas and match-influencing blunders. They are far too busy and important to bother themselves with the concerns of a single rugby fan, especially an obscure old fart that has long retired from active participation in the game. Their singular disregard for the entire fan base is legendary. Their complete disregard for the comments, complaints and suggestions of players and coaches is equally legendary. SANZAAR’s administrators are not known for keeping their ears to the ground nor their senses tuned to the discontent of the masses. So, I am guessing, it must have been one or two of those people that Sanzaar consider important that has signalled discontent with matters officiating? A sponsor? A TV broadcaster? Someone with money!!! I do not know who, or how, but someone must have got through to those suits as they stood clustered around the buffet tables in their luxury suites at the rugby stadium. Why else would they suddenly announce that they are reviewing the use of the TMO? SANZAAR have highlighted the use of the Television Match Official as a “major concern” for them ahead of their annual season-conclusion review. At the conclusion of each season SANZAAR conducts a “thorough” review of its competitions and looks to continually enhance and improve the “product” for its stakeholders. 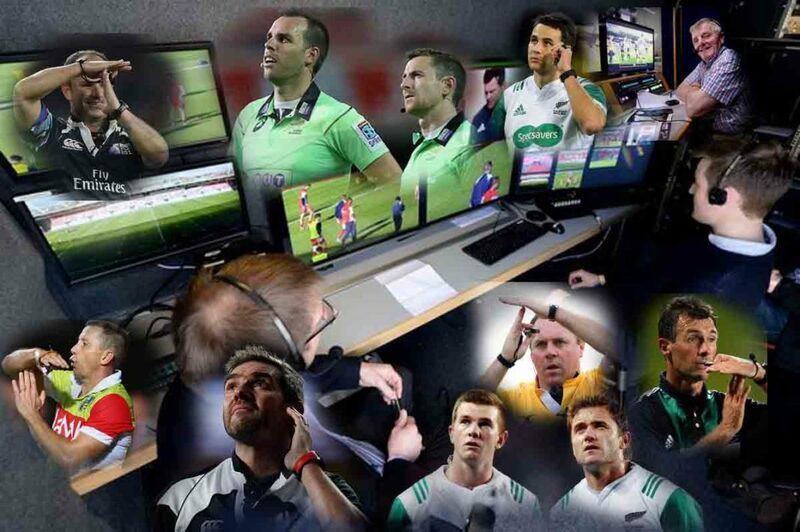 The past four weeks of international and domestic rugby have highlighted some serious deficiencies within the match officiating processes in the game of rugby, in particular with regards to the use of the Television Match Official. “SANZAAR is not empowered to adjust any protocols that have a direct affect on the Laws of the Game. However, we are keen to lead the discussion in this important area and following our review we will take our recommendations to World Rugby, the guardians of the Laws of Rugby, to ensure beneficial outcomes are achieved for the game. If Mr Marinos is correct and the appointment of referees for the Super Rugby Quarterfinals will be merit based, will we see Ben O’Keefe in charge of a match after some of his spectacular mistakes in the last couple of weeks? 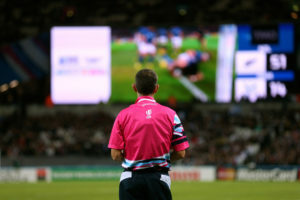 The business of keeping “abreast of law changes and specific directives passed down from World Rugby” tells of rugby’s confusion in dealing with application of the Laws of the Game and the understanding of them by referees, assessors, commentators, coaches and the rugby public at large. As that remarkable doyen of rugby refereeing Paul Dobson has frequently bemoaned: There is the additional scourge of referees that simply make up their own “home-made laws” and have their own private interpretations of the laws that are frequently at odds with the written word. While they are at it, will SANZAAR be addressing the plethora of yellow and red cards that have spoilt the game in recent months? And then there are the referee appointments themselves. How does it happen that a referee, dropped by Super Rugby, then is appointed to referee the PRO 14 final? How is it that another referee, who had only three senior matches on his record, is appointed to referee World Rugby’s Under-20 final? The fact is that appointments are dominated by New Zealand referees, perhaps because the man in charge of the referees at SANZAAR is himself a New Zealander? Next articleBok Camp Call-up for Damian Willemse, JD Schickerling, Marco van Staden, Salmaan Moerat and Cobus Wiese.